Amherst Town Hall is located at 4 Boltwood Avenue, Amherst MA 01002; phone: 413-259-3333. Photo: Conkey-Stevens House, ca. 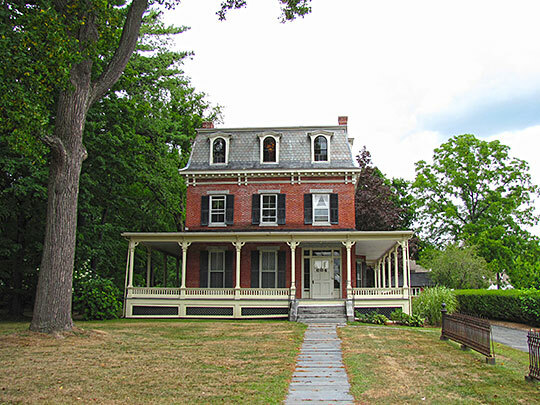 1840, 664 Main Street, Amherst, MA. Listed on National Register of Historic Places in 1979. Photographed by user:John Phelan, 2010, (own work) [cc-by-3.0 (creativecommons.org/licenses/by/3.0)], via Wikimedia Commons, accessed June, 2013. Wireless access is available from most public buildings and outdoor public spaces in downtown Amherst. The Town of Amherst occupies a position a little east of the center of Hampshire County, which was established by act of the General Court in May, 1662. The original county included the present Berkshire, Franklin and Hampden Counties. Amherst is about 28 square miles and contains the villages of Amherst, North Amherst, East Amherst (or East Street) and South Amherst. Amherst was settled from the west. It lies among the lower foot-hills of the Green Mountains, east of old Hadley, of which it was long a part. The original settlers, coming mainly from Hadley and from Hatfield (then a part of Hadley) were nearly all descendants of the earliest Hadley settlers. Their ancestors, with few exceptions, had come from England to Massachusetts Bay between 1631 and 1635, and finding less land near the shore, and less freedom than they wished, sent explorers, in 1633, by land and water to the Connecticut River. In 1635 and 1636 they moved through the wilderness to the fertile valley, settling at Wethersfield and Hartford. There they remained for almost a generation, until religious disputes in 1750 and 1760 led a part of the body to move to Hadley. Sixty-eight years intervened between the occupation of Amherst and the settlement of Amherst, although the lands of the latter place were more elevated, lay but four miles away, and were within the boundaries of the town. Amherst was incorporated as a township in 1759. Frederick H. Hitchcock, The Handbook of Amherst, Massachusetts, Press of Berwick & Smith, Boston, 1891.